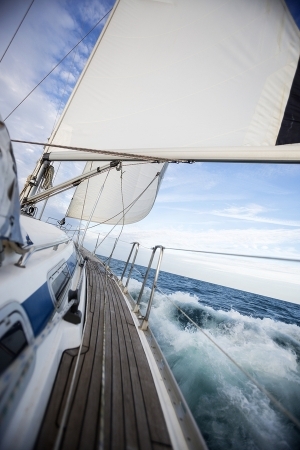 At Horizon Yachting we thoroughly understand the yachting industry and maintain excellent working relationships with people and companies that cover every aspect of the business. Private boat share syndicates. Solo ownership of a sailing yacht can mean a lot of money and hassle and unless you are a full time live-aboard sailor, chances are you will utilise your yacht significantly less than full time and certainly not enough to rationally justify the full cost and effort. Owning a share of 20-50% according to the usage you are able to put in, can mean amongst others: less cost and hassle, a bigger/better boat that is maintained to the highest standard and venturing further afield as shareholders can split the cruising legs. Horizon Yachting is here to alleviate every concern that comes with shared yacht ownership by providing one contact person, running all maintenance and repairs, ensuring timely handovers on the previously agreed time-share schedule of clean yachts in tip-top condition with full fuel and water, spreading and collecting dues from the owners accordingly in full transparency, and running both the purchase as well as the sale of the boat at the expiration of the syndicate contract so the shareholders can split the proceedings and move on. Yacht purchase consulting: If you are interested in buying a yacht we can assist take most of the hassle and uncertainty away: from exhaustive market research and due diligence on craft, to employing full professional survey and sea trial, and from the registration procedures, licensing, and insurance to marina berthing options. Yacht deliveries. Maybe you want a newly purchased yacht from abroad delivered to its berth in Cyprus, or you just fancy meeting your own yacht in your port of choice (abroad or in Cyprus) avoiding doing the long leg yourself? Our delivery skippers are instructor qualified with thousands of sea miles experience. Owners welcome on board. Let us know of the itinerary and craft for a quote. Maintenance projects. At Horizon yachting we can organise the maintenance of your yacht through our extensive network of contractors. Owners have one contact person who organises all tasks, makes sure that no unnecessary costs are incurred and that the tasks are performed timely, efficiently and to the highest standard. From specific repairs and upgrades through seasonal maintenance to full management (maintenance, repairs, annual dues, regular checks, cleaning, provisioning, fuel etc) so your yacht is in the best possible condition whenever you show up, no job is too small or too big for us. At Horizon Yachting we strive to serve our clients and exceed their expectations. Let us know of any request you may have and we will do our best to assist and guide you to the right direction.